On May 12, a second deadly earthquake struck Nepal, derailing its recovery. Last month’s earthquake in Nepal completely destroyed Bina Dangol’s two story home in Khokana, a small town just west of Kathmandu. She finally moved into a rented accommodation a couple of days ago with her parents and three sisters, after living in a tent for two weeks. But when tremors struck Nepal once again on Tuesday, coming in at 7.4 on the moment magnitude scale, Dangol’s family were once again surrounded by death and destruction. I called up Dangol immediately after the quake, only to find her trembling with fear, barely able to speak coherently. Dangol is not the only one asking these questions. Tuesday’s quake has delivered a jolt to the people of Nepal, already traumatized by the worst natural disaster ever to hit the country. In Kathmandu, big cities, and small villages throughout the country, residents live in constant fear. The second earthquake has derailed Nepal’s fragile recovery. Daily life, which slowly limped back to normal after April’s disaster, is back to square one. Tents, which had begun to disappear from Kathmandu, have returned to the capital and surrounding valleys. The epicenter of Tuesday’s earthquake was 75 kilometers east of the capital, in Sindhupalchowk, a poorly developed region near the Chinese border. It was the second major jolt to an area where the majority of houses have already been destroyed. 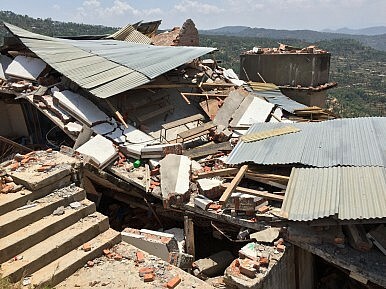 News reports say over 60 people have lost their lives in the latest major earthquake, and over 1,000 have been injured. Seismologists fear that smaller quakes could recur throughout Nepal. The extent of damage the country has suffered is already immense. Places like Sindhupalchowk, Sankhu, and Lalitpur are damaged beyond recognition. What’s left of local administration is dysfunctional, and the rescue operation is proceeding at a crawl. It will take months before the debris can be removed to make way for new structures. Sindhupalchowk consists of 300,000 people spread across 80 villages spread and three municipalities. More than 90 percent of these villages are damaged, but only 15 have received any support. Most villages are still beyond the reach of rescue teams. Some villages are surviving on what little they have, mobilizing support at the local level. Dealing with the monsoon season will be an even greater challenge. With the majority of Nepal’s people living in makeshift tents, the rains could wreak havoc, bringing the potential of floods and landslides. Relief and rescue operations must be expedited. Kathmandu is already in a panic, with throngs crowding bus stations to escape to villages unaffected by the quake. Local administrators can’t meet those needs, which recently sparked protests and discontent. Nature is testing Nepal’s resilience, and Nepalis will need the world’s help to withstand this crisis. Both India and China have reacted swiftly to Nepal's calls for assistance after an 8.1 magnitude earthquake on Saturday. Nepal Hit By Powerful 7.8 Magnitude Earthquake, Death Toll Approaches 900Rescuers Struggle to Reach Storm-Struck Area in Nepal as Death Toll ClimbsNepal’s Success in Wildlife ConservationModi’s Desperate Move to Rebuild His Image in NepalIs This the End of India's Influence Over Nepal?